CRBA Monthly Public Meeting is on Tuesday! Making Peace is a major outdoor photographic exhibition curated by Ashley Woods (Nobel Museum), that pays tribute to the people who‚ all over the planet, devote their time, energy and resources to the cause of peace. The exhibition will be on display along the Front Street Promenade from May 13-September 24, and is accompanied by a free Educator’s Guide that allows students to learn about the ‘5 Key Elements of Peace’. Come and meet the Educational Programs Manager, and co-author of the newly-release book, Create a Culture of Kindness in Middle School: 48 Character-Building Lessons to Foster Respect and Prevent Bullying. St. Patrick’s Day Neighbourhood Party! Come out and celebrate like the Irish in Corktown! The City of Toronto has created a survey for the King Street Pilot Study. The survey must be completed by March 20 and takes 10 – 15 minutes to complete. Why not do it now? Here is the Survey Link. Sugar Shack returns to Sugar Beach! Sugar Shack TO will have everyone celebrating the last days of winter with two sugar shacks serving up maple taffy, ice activities, a food marketplace, live entertainment, a specialty bar and much more! The Yoga Lounge has opened in Corktown! Welcome to The Yoga Lounge!! This new Yoga Studio has recently opened up in Corktown. The CRBA, Living Toronto and Redline Coffee will be hosting the annual Easter Egg Hunt on April 16 at 10:15am in Corktown Common. They are in search of an entertainer for the kids (music, magic or ??). If you are able to help out the neighbourhood children, please contact Socrates@corktown.ca. 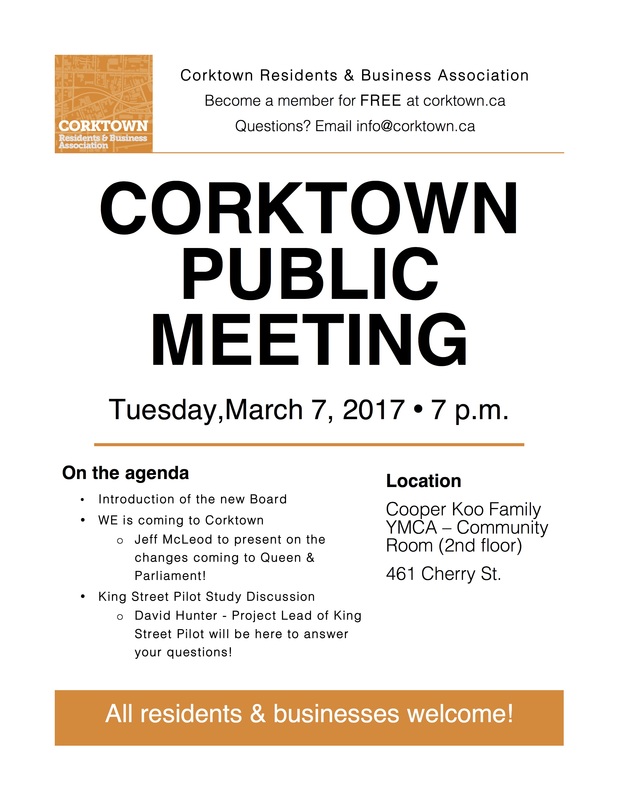 eNewsletter: CRBA meets Tuesday, Dominion on Queen’s grand re-opening, TTC survey + more!